Growing up in Glasgow’s state-schools, children are taught the significance of education as a force that can improve the material conditions of their lives. The focus is not on the philosophical and political urgency of education for an economically, culturally and socially oppressed people. 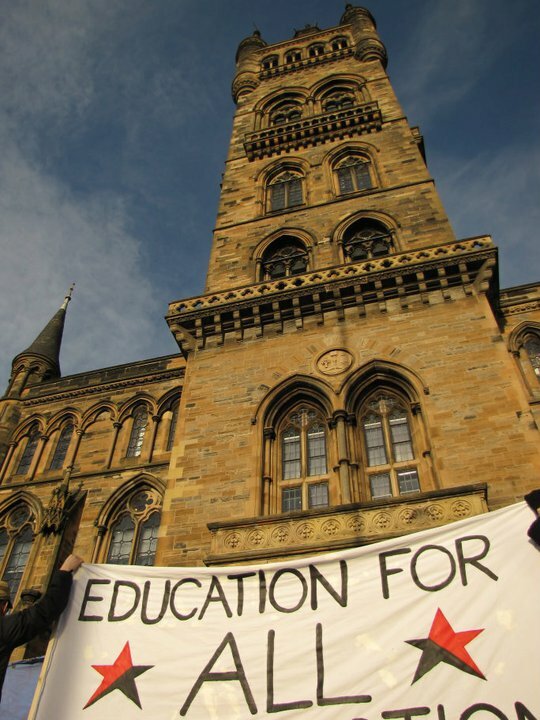 The focus is instead on furthering an individualistic and inherently capitalist mythology about the parallel improvement of the self and the social standing, the primary function of which is to provide existential justification and support to the various commercialist higher education institutions around Scotland today. The story goes that the student who works hard at school will gain access to higher education and through this education they may improve their individual circumstances. 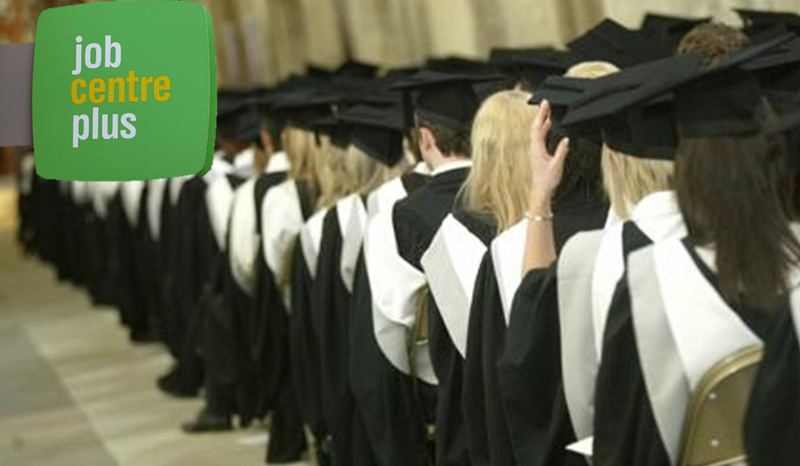 Not only does this serve as advertisement for the higher education system but, by directly linking hard work and access, it also feeds directly into many of the inferiorising judgements and stereotypes levelled towards economically under-privileged people, particularly those in positions where they must rely on the welfare state and those who have been forced off of the benefits they once relied on. There’s plenty on – and off – the dole in Glasgow. The first step in fighting cultural hegemony, in decolonising the mind, and in affecting change in the world is to expose myths for what they are. The first clause in the mythology of higher education suggests that if a person works hard at school they will gain access to university. Or more accurately, if a person is clever and works hard at school they will gain access to university. Ranking potential and performance in school examinations is a massively problematic area, particularly so in the Arts, and there are questions of how academic performance, ranked potential, and economic privilege are connected that should be continuously addressed and re-addressed in the Scottish context. That is a different essay, or a series of different essays. In the current context, what is important to highlight is the following. Higher education institutions in Scotland receive one rate of subsidised tuition fee from the Scottish Government via the Scottish Funding Council for each Scottish student who is granted access. International, English, Irish and Welsh students all pay a higher rate of tuition fee directly to the institution. Therefore, it is in the best economic interests of any university in Scotland to favour applications from students residing out-with Scotland. The enemy of widening access is not snobbishness and bigotry against state school educated people pure and simple, although that is certainly an aspect of it. Old bigotries die hard. The opposite of widening access is internationalization. Internationalization is the practice of favouring the provision of university access to international people with the economic means to pay that higher rate of fee. This is compounded by the fact that, within the diminished numbers of Scottish students gaining access to higher education, fewer state-school educated students are gaining access than their privately educated peers. State-school educated students in Scotland are double-victims in this sense. The supportive mythology of the higher education system which dictates that hard work at school provides access, like the concept of assessing personal potential that lies beneath, is a myth. It is not necessarily the endeavours of the individual that leads to access. Neither is it a predetermined or cultivated individual potential. Instead, to a large extent, it is the social, economic, and by extension cultural circumstance of the individual that determines whether or not they will get a place at university. It is a combination of where a person was educated (in Scotland, at a state-school, at a Catholic school) and the bigotries and nepotisms that resonate throughout the infrastructure of higher education admissions systems that effectively determines who is given access and who is not. To be told that intelligence and hard work necessarily precipitate university admission is to be lied to. Here are two examples from the Catholic state-school I attended. Firstly, an aspiring medical student, with 5 A-Grades at Higher level in the relevant subjects, and a further three Advanced Higher A-Grades in Biology, Maths, Physics. She was refused access to Medicine at the University of Glasgow. She was later accepted to another university elsewhere in Scotland but as a result of her personal circumstances was unable to relocate. She is now a primary school teacher. Secondly, an asylum seeker who was an aspiring dentist with similar grades, including three A-Grades at Advanced Higher that placed him comfortably above the minimum entry requirements for Dentistry. He was refused access to Dentistry at the University of Glasgow. Likewise unable to relocate, he was eventually accepted for his third or fourth back-up choice of studying Aeronautical Engineering. After graduation he found that employers in his new field favoured hands-on experience over four years of theoretical tuition at a university and he is currently on the dole. International students pay a substantially higher tuition fee per annum for Medicine and Dentistry than for Arts subjects and Engineering. There is thus a hierarchy of subjects that state school educated students are likely to gain access to, with the best paid positions behind a largely bulletproof glass ceiling. I mention that the second student was an asylum seeker to elucidate the point that opposing internationalization is unrelated to xenophobia, and that to fight against internationalization so that Scottish students stand a better chance of gaining access need not incorporate any essentialist conceptions of what it means to be Scottish. Let us entertain the idea that, even if only being accepted to study their second, third or fourth choice, state school educated people who do gain access to Higher Education are guaranteed improved future employment rather than the dole queue. We know that there is a disconnection between effort (and ‘potential’) and access. So, those state school-educated students who, by the luck of the draw, are given access to appease governmental spectators in positions of influence over Higher Education funding policy – which is tokenism by any other name – would be held up as proof that the mythology of university is true. These ‘success stories’ would serve as a condemnation of the laziness and sloth of their counterparts who did not work hard enough, or who were not clever enough, in a mechanicism that we recognize in the parallel mythology of the American Dream. In this scenario, it is important to look at the hegemonic and gentrifying forces active within the interior of the Higher Education system, particularly in those subjects which the universities are most likely to accept Scottish state-school students to, namely the Arts. Once again, Frantz Fanon’s study of French colonialism in Algeria is invaluable for illuminating the power of academic psychosocial manipulation in creating barriers between a person and their socio-economic and cultural roots, forcing socio-economic migration and cultural dislocation rather than providing empowerment and voice. Things fall apart for the supportive mythology of the higher education system in Scotland where the provision of employment to those token state-school-educated students does not exist. The interior logic of conservative government has all but destroyed both the job market and the welfare state. This is partly responsible for the increased visibility of questions of access in mainstream media over the last five years. These students have been conferred the necessary status symbols to grant them a voice not available to their state school peers, but they are not materially or economically separated from their state school peers in postgraduate life. University, particularly the Arts, is becoming a four year precursor to signing on – except for a scattering of people with connections and a lucky minority. We look again to Fanon and his discussion of the revolutionary importance of a native graduate returning to his people in the struggle. In Scotland today, the state school educated university student is, in a majority of cases, making a material return to his people in post-graduate life. 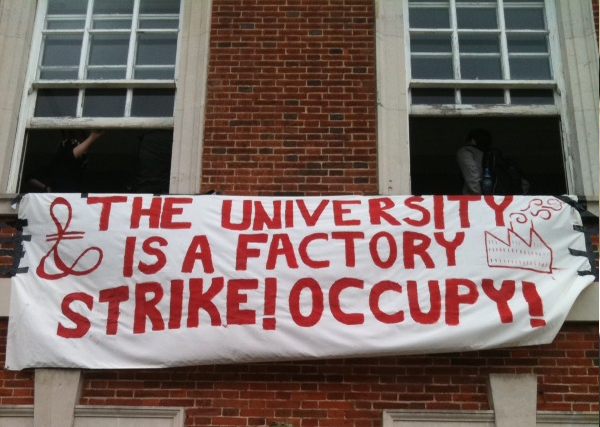 I wonder if it is too soon to talk about a revolutionary moment in the infrastructure of higher education in Scotland. It is becoming increasingly apparent that the higher education system is bigoted and broken and the cracks are becoming difficult to smooth over. The mythology about working hard at school, getting in to university and getting a good job is becoming exposed as a series of woof tickets and the institutions are coming under increasing scrutiny. It is possible that the material conditions of life for state-school educated university graduates is breaking down the psychosocial barriers traditionally thrown up by a hegemonic academic order between them and their school mates, both groups having been left high and dry by the higher education institutions of Scotland. I wonder if it is too soon to start talking about boiling points and atmospheres that precipitate change. It feels that the stage is being set for a complete overhaul of the higher education system in an independent Scotland. There’s little doubt in my mind that in a Scotland rid of the scourge of British rule the higher education system would find itself standing on extremely thin ice.